The rumors have finally come to an end with the official release of the Taiwanese company's latest flagship – THE HTC ONE X+, the successor of the latest HTC One X, yesterday. HTC finally unveiled the One X+ with a number of hardware improvements, a new color scheme and updated version of HTC Sense. The HTC One X+ is powered by a quad-core NVIDIA Tegra 3 AP37 chipset, whose CPU is rated at 1.7GHz. It has 1GB of RAM and 64GB of inbuilt memory. Its display is a 4.7 inch-ed LCD unit with 720p resolution, coated by Corning Gorilla Glass 2 with optical lamination for reduced light reflection. It has a 8 MP camera at the back with autofocus, capable of capturing 1080p videos and a 1.6 MP Front facing camera capable of capturing 720p videos and for all your video calls. 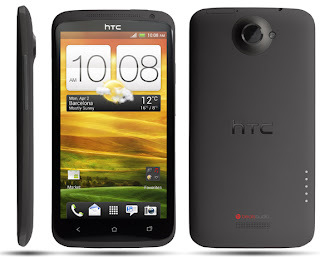 The HTC One X+ will feature the latest version of Android, THE ANDROID 4.1 JELLY BEAN and also the latest HTC SENSE 4+. It will also feature HTC Get Started - a web service which will allow you to easily personalize and setup your smartphone from your computer. Beats audio is available too with the speaker having its own built-in amplifier. Other improvements include a bigger, 2100mAh battery that, according to HTC, offers 50% more talk time compared to the One X. The HTC One X+ will be available in Europe and North Asia this month and South Asia (including India) in November. HTC also confirmed it will start rolling out the Android 4.1 Jelly Bean update for HTC One X and HTC One S this month. 0 Respones to "HTC One X+ with Android 4.1 Jelly Bean is now official"